A new research report by the Girl Scout Research Institute (GSRI), shows that girls experience significant benefits when they spend time outdoors. The report, entitled More Than S’mores explains that young girls who regularly spend time outdoors eclipse their indoor-bound peers when it comes to environmental stewardship, seeking challenges, and problem solving — the perfect combination of traits and skills for girls who will grow up to be twenty-first century leaders! 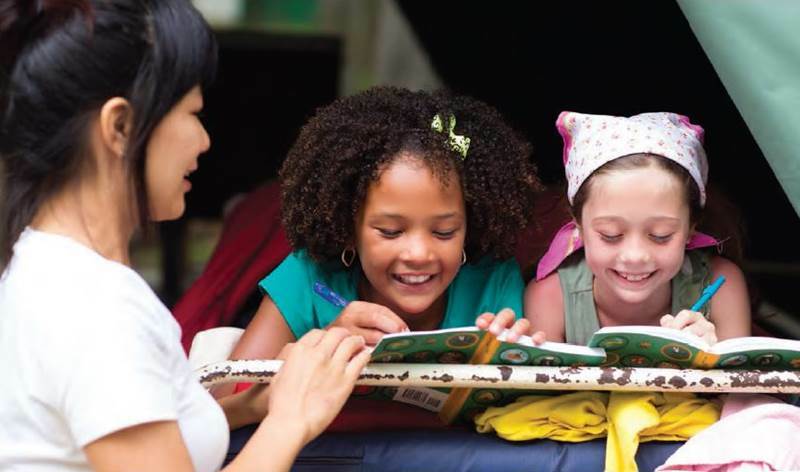 Girl Scout camps have been around since 1912 and are available to girls in all 50 states. Better yet, today’s camps are highly evolved, matching the interests of twenty-first-century girls. As the Girl Scouts state, they move “At the speed of girls,” evidenced by a wide and growing range of camp offerings and activities from surf camp to Hogwarts camp, farming and sustainability camp and Camp CEO, all of which follow the Girl Scouts’ mission of helping girls to build courage, confidence, and character, while making the world a better place. Yet unfortunately, the More Than S’mores report notes that due to, “Parental protectiveness, increased use of technology devices, and a host of structured activities competing for children’s time” many girls won’t become scouts and overall are spending less and less time outside, a problem that may cause girls to suffer physically, emotionally, and cognitively. Keep reading to see some key findings from the report and learn why becoming a Girl Scout is an excellent choice for your daughter. Girl Scouts get outdoors more often: With high exposure to the outdoors in Girl Scouts, girls play outdoors and go on outdoor field trips much more often than girls who don’t scout. Girl Scouts have adventures: More than half of all scouts participate in high-adventure activities such as canoeing, kayaking, ropes courses, backpacking, climbing, and more. Girl Scouts seek challenges: Girls who participated in outdoor activities in Girl Scouts on a monthly basis were stronger challenge seekers and problem solvers, skill sets associated with academic success. Girl Scouts are leaders: Girls who participate in scouts agree strongly that Girl Scouts affect their ability to take on leadership responsibilities, and this aspect was particularly true of girls who felt they had low self-esteem. Girl Scouts care about the environment: More than two-thirds of Girl Scouts volunteer for environmental causes through the organization and the report data shows that this participation was the strongest and most significant predictor of girls’ environmental stewardship overall. Maybe most importantly, Girl Scouts have fun and build memories: Overall, girls surveyed for the report said camping was their number-one most memorable outdoor experience in Girl Scouts. However, girls also mentioned many other top fun experiences due to scouting, including making friends, being part of a troop, learning new things, cooking fun, hiking and much more. 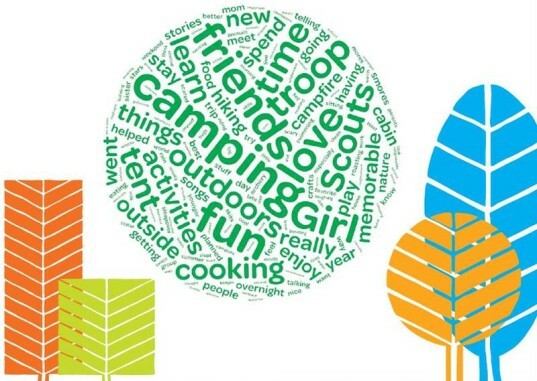 In fact, the researchers analyzed girls comments about Girl Scout experience and looked for themes based on the number of times a word appeared. The image you see above is a word cloud derived from this analysis, and as you can see, girls have many positive emotions and experiences through Girl Scout participation. Find a Girl Scout troop or camp near you and help your daughter experience all that scouting has to offer.